Dry Fly Silicone is easy to use to prepare your dry flies for fishing. Open the screw cap, insert the fly, close the screw cap and shake the bottle. Open the screw cap and take your prepared fly out. Best results by preparing the flies one day before use or longer. 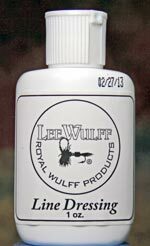 This fly line dressing by Wulff works on all fly lines with resin based coating from any manufacturer. On drying, it forms a relatively hard and dirt-repellent surface which also improves the line's shootability. Used regularly, it will increase your line's lifespan. Push the button and open this nice gadget to connect nets, tool etc to your vest. I've been looking for one of these for quite some time, only those already on the market seemed a bit too expensive to me. 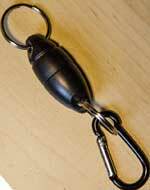 This one has strong magnets and will hold a net securely. Actually, I'm my first customer for this item, as I usually carry an oversize net (Ø 70 cm/ 27.5'') in Canada, which has a habit of always getting in my way somehow. Well, there's one problem solved! The Loop-on is the best way to connect your leader to any flyline. Push the flyline in the open end of the braid, secure it by sliding the little piece of plastic tubing up towards the enf of the braided part and voilá - you have a nice loop at the tip of your flyline. The Strike-indicator is located between your leader and your Loop-on. It will help you to recognize those subtle strikes you have been missing so far. A very handy item for trips is Jenzi's fly line cleaner. After fishing, just pull your line through the dressing-soaked pad and you'll be able to take up fishing the next morning with a clean and well impregnated line. If necessary, you can also start fishing again right after cleansing the line, but the dressing's effect will not last as long as it will if you let it set overnight. Pads can be used several times. One box contains four pads. The tippet ring is a very helpful way to connect a tippet to your leader. 10 rings in a bag, for easy use on a safety pin.